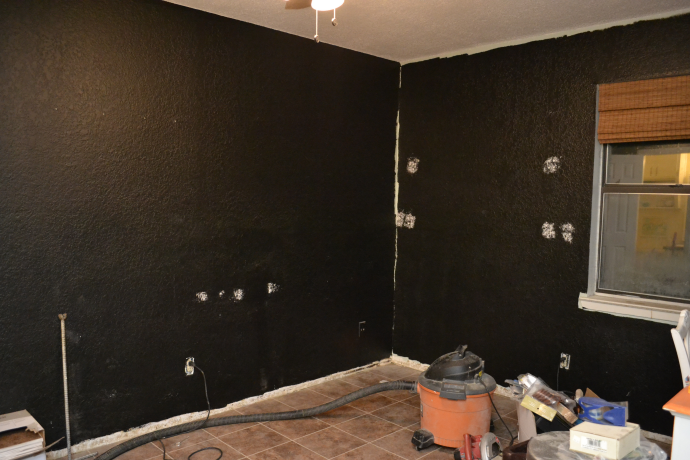 I’ve finally started painting the black walls in the office (which is really, officially the master bedroom). A while back, I started painting the walls black, but I never not around to finishing. So I’ve just lived with my walls looking like this.. I knew that black walls probably weren’t the best choice for a condo that’s about to go on the market, so I decided to paint them brown. Yes, I know…that’s probably not much better. 🙂 But let’s face it, I’m just not a “neutral” kind of person, and I thought brown would be pretty. So I decided to use the same brown that I used on my chalkboard door and the small stripes on the curtains that cover my washer and dryer closet. Which is also the same brown that I used on the other side of the hallway in the utility closet, both on the argyle walls as well as the ceiling. It looks so deep and rich in those pictures — not too red, not too green. Right? So why, pray tell, do the walls in the room look like this? That seriously has to be one of the ugliest, most offensive colors I’ve ever seen on a wall. I won’t say what it looks like, but I’ll say it’s something that people would never want smeared on their walls. So I definitely need a new color. I was thinking that I would just pick out a new brown — something a bit richer and with more red in it. But then I thought…you know what would be daring for me? A white room. It’s so not my personality that it would actually be a daring choice for me. 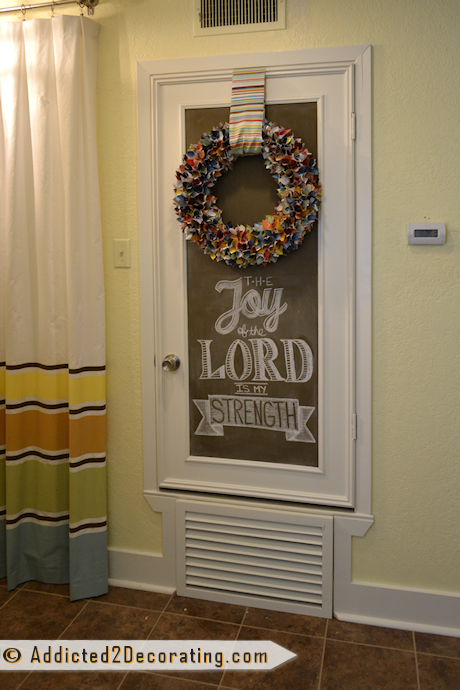 Plus, it would be good for making the room appear lighter and brighter (good for selling). Anyone want to wager a guess on how many coats of white paint it’ll take to cover up the black and brown walls? Okay, you may be too much of a lady, but I’ll tell you I’ve seen that color many a time… in baby diapers. YECH!!!!!!!!!! I’m like you, and I sometimes think I’m “allergic” to white. But I’ve found myself going with calmer colors lately. I think a creamier white would go better in my home, but I can see white in that room. GO FOR IT. Yep, you read my mind. That’s exactly what it looks like!! 😀 Definitely not a good look for bedroom walls. Definitely not a pretty color. 🙂 Are you thinking a really white white? I think it should have a little color, but what do I know. Definitely a light color though. I’m sure you will come up with the perfect paint. But who knows? I might find something completely different at HD that I want to try! I think you should paint them the yellow or green that you have in the rest of your house. The room will seem very odd painted white, when the rest of the house is so full of color. Love the work you have done! take it from someone who had to paint a red room back to white for resale…Kilz primer is your friend. It will reduce the number of coats of white you need and it will make the end result appear like there was never brown (or black) paint on the wall. I’m with Traci. Kilz is the only way to go even though there are other primer/paint combos out there now. I know first hand they don’t do the job like Kilz no matter the color you opt for. Good Luck! I agree with one of the girls above. I think your condo is so unique in all other rooms that white would look off a little. This room is the one with the little bathroom right? I would pull a color out of those cute curtains that you made for the shower to tie the two room together. Have had that happen before. A color looks great in one room and downright frightening in another. It’s the light in that room. You could possibly sponge over two of the walls and repaint the remaining white. Ironically, I fixed something very close to this color once with a light blue and then sparingly used white sponge and it looked gorgeous when done. Just did two adjoining walls that way and the rest in a soft beige. I can’t wait to see how the bedrooms turn out. Thanks for posting the floor plan. It’s nice to see how it all comes together. We have all enjoyed seeing this condo evolve into the gorgeous space it is today, so it will be bittersweet to see it finished and sold. However, I am so excited to see what you will do with a whole house! Screw white! I would go with either green or blue to match the colors in the bathroom and kind of tie in to the colors of the hall. Too bad about the colour going completely off in the room. It’s amazing how different a colour can look from room to room depending on light. You sure have your work cut out for you by having to paint over all the dark. One of the reasons I enjoy your blog is that you like to surround yourself with colour. I am the same way but I do have white kitchen walls (crumb cookie, how appropriate) only because I have a low ceiling in a small room plus a lot going on otherwise. Looking forwards to seeing what you come up with. Something like Sherwin Williams SW6112 Biscuit or 6378 Crisp Linen. (Yeah, I’m cheating…I have a color chip fan beside me). I think if you go white, match your trim color. It will look really modern and fresh, and at least the white will tie in with the rest of the condo. But, you might also try that nice color you painted the walls in the adjoining bathroom, or, like someone else said, pull a color from the shower curtain. I’m sure it will look great, whatever you choose. Kristi, you are the queen of color and white is so not you. Perhaps something from the beautiful rooms you have already done? But white no…. I would go with blue that matches the tiles in the kitchen and on the curtain. it would flow better and tie it all together. I have faith that you will totally rock white, Kristi. But look at yesterday’s post – navy blue? You could bring in color accents that repeat the rest of the house. But you are really painting for someone else, and real estate agents, who have some of the blandest taste in the world! I obeyed my last agent and the house sold in three weeks in 2010. Oh my, it looks like poop! o.0 Good call on changing the color before you’re committed. Whew! Yikes! That’s a lot of repainting to do but hey, sometimes we just have to do what we have to do! Good luck! You are right about the brown, not good. How about the blue in the argyle pattern? To cover that brown, you’ll need to prime first. But you already know that. I’ve had to cover dark colours before. What I did is have the primer tinted the new colour. I still needed two coats-1 primer, 1 paint. This worked for me. Hope this helps. Wishing you all the best! Consider the yellow of your bathroom….that is almost a neutral…. Oh, you are a hoot, Kristi!! I literally LOL’ed reading this post. Thanks for the laugh, just got back from divorce mediation, so I needed a little humor in my day. Yeah, that wall color does look pretty ghastly. SO glad to hear you are painting it white. 😉 I love your stubbornness, though. You remind me of me. pick the colors from the bathroom, so the rooms will blend nicely. You are so amazing with color and design, I have no doubt that once you are finished, this room will look amazing with white walls. My vote: pale blue/gray so light that it’s almost white. Pops of orange and white for accents and white trim. Yowza! Yeah that’s not the best, but it’s great you have a sense of humor about it. If you are still looking for a brown, or maybe a green (I know you said white, but *maybe* you still have half a mind for other colors 😉 I love my great room, it’s more of a tan than brown but still, same family right? It’s SW Beach House. And my favorite green of all time is Behr’s Boston Fern. Just the right amount of grey to make it a neutral. 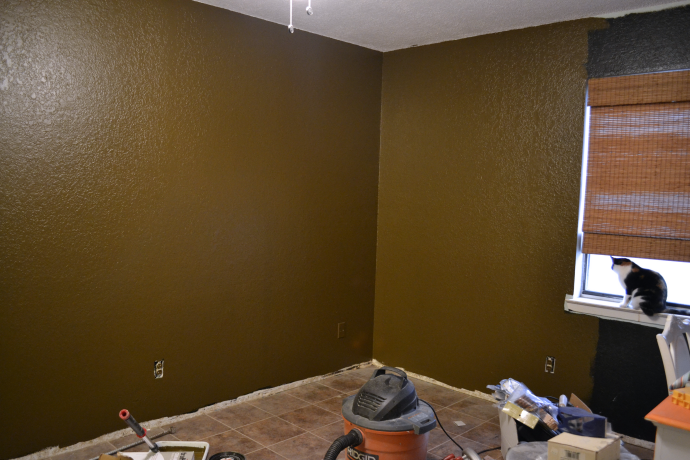 Yeah, anytime I’ve had dark walls and tried to cover them the new paint looks like kaka. Our local paint store recommended using at least 2 coats of primer to seal in the dark color (and you may need more because your paint is “fresh”). THEN you can put your white or light color on with less chance of the under color changing the new color hue. That’s a LOT of paint and a lot of time, but necessary evil. As for white walls….think of it as a clean slate, literally…..then think of all the color play you can do with it! I love starting with white walls and then painting murals, stripes, even did a polka dot room once. Of all the decorating you can do, paint is the most fun because it’s so easy to change…and most times cheaper than most of the other stuff in the room. Yep. Baby poop brown, all right. Yep, it’s called Polar Bear. It’s the same creamy white that I’ve used on all of my trim, doors, board & batten walls, and living room bookcase. 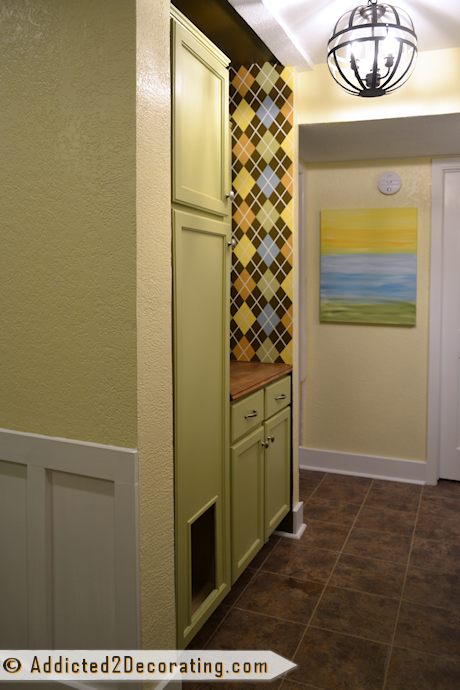 How about using the green you have on your hall cabinets? I once lived in a house with “sponged” paint. It nearly drove me mad. Just back away from the sponge, please, just put it down. I love that green. 🙂 It’ll make an appearance (or a green very close to it), but not on the walls. As a general rule, I agree with you about sponged walls UNLESS the paint color difference is very subtle, like a really light gray over a light or medium gray, or something like that. VERY subtle. Kristi, What is the name of the green on your hall cabinets? I love that color and it would be perfect for my kitchen cabinets! I just know in the end you’ll find the perfect color for the bedroom walls..
LOL! This post makes me chuckle, and the comments are making me smile too. 🙂 It’s true, we’re all thinking it! 🙂 White will look good and I’m interested to see how you will like it. You might even go with another color – a light color will be good for this room. LOL..yeah baby poop…not pretty…so why praytell did you not STOP when you had an inkling that it was not going to be a good color? I am asking because I chose a yellow once that I was going to rag into a tuscany feel…and it was a god awful school bus yellow and I couldn’t stop myself from painting the entire room even though I knew I hated it!! lol. It is interesting that your brown was a solid choice else where..that argyle wall thing is awesome! wish you were my bestie that lived two doors down from me! Try a different lightbulb, before you repaint the room….that can make a HUGE difference! Uhmmm … uhhhh … oh dear. I hardly know what to say! How on earth did that gorgeous brown go from looking like a soft teddy bear to … bear POO on your walls? That is so weird! I have never seen any of your projects or design decisions fail, so I’m blaming the paint (could it have gone bad in the can? Could the color have been mixed wrong?). Maybe the color went on differently over black than it would have over builder beige? I will second (third?) the suggestion upthread that you don’t try to paint white paint over the black/brown combo, but instead put on a good coat of Kilz Primer first. That stuff is lifesaving, and will save you time, effort, and money because you won’t have to put four coats of white paint on the walls. As for the color of the walls, part of me agrees with others that say the condo is so full of color, having a white room might seem … odd. What about painting it the blue in the argyle pattern? That’s a gorgeous color! To cover dark charcoal gray in a room in our old house, we did 2 coats of primer (Kilz I think) and 2 more coats of the paint. You might like a cream color in that room. My favorite is Ace Royal’s color called “crushed peanut”. The color reminds me of vanilla ice cream. I’ve used it on walls and cabinets, mixed with both light colors and dark. That sounds really lovely, I’m going to check that out. It sounds like it would look really good with black. I also think you should go with something that blends more with the rest of your rooms. However, strong colors always look terrible on the walls w/o anything in the room. I suggest you finish and move things back in. You may like it! You can always reapaint. Love your blog. How about a taupe with white crown molding. Or faux one wall with some martha stewart finish and the other three some taupe. Cannot wait to see what you decide. Since the walls are already dark, why not do a deep dark blue- in satin finish? I’m gonna be stingy and save the dark blue for the house. 🙂 It might ruin the fun for me if I’ve already used it in the condo. Yes on the primer to save money and time. I once moved into a house that had many of the walls painted a light tan. Did you know that’s a color many photographers use because everyone looks attractive irregardless of skin tone. I didn’t think that I would like it at first as this was in British Columbia and the rain, but in the end I found it a delightful color to work with. It looks terrific with large whit shutters. I like the blue that’s in the curtain in the hallway laundry room. Is there a hue of blue in the floor I see? Oh dear! I literally LOL’d at your description of the ‘not quit the shade of brown I had in mind’ color of that room! Oh, I hope for your sake it’s not four coats to cover! Yikes! I think it will take more than 4 coats. I painted white over a light gray and 3 barely covered it.unless you go with a really thick paint,or a primer that also seals. Good luck! I think a pale pretty gray is what you should do…..that will make the room seem bigger and brighter, but without white walls!! Once again I loved reading your blog, I dare say we’ve all been in this boat as some point. It usually happens to me in my personal home projects rather than in my professional projects, go figure. I painted my home office a few colors before I finally painted it chartreuse 4 years ago and I’ve loved this space ever since – it’s so uplifting. 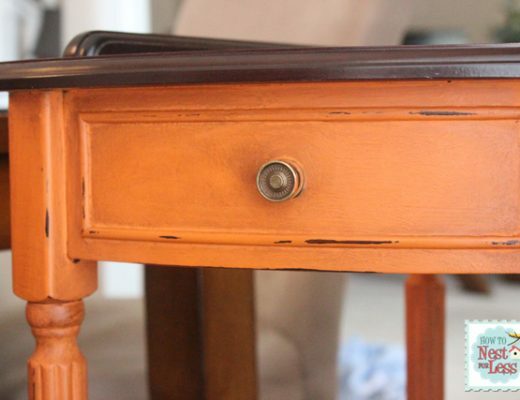 The previous colors were paint colors left over from miscellaneous jobs or Oops paints found on sale, they were always slightly off for what ever reason. But it taught me an important lesson to never use a material just because I already had it. I take this same principle to work and never give in to someone saying ‘lets use this, because we already have it” whether it’s paint/tile/wood/fabrics, don’t get me wrong I’m all about recycling/repurposing which we do on every project. Back to your dilemma just make sure you give it two coats of a block out primer and two finish top coats and never a shiny finish. So yeah, your bet is right on x 4 coats. Buy Benj Moore paint called Aura … it doesn’t have as much VOC and will cover much better. It’s more expensive but worth it in fewer coats, dries faster, and less smelly. You can get some beautiful colors there too, if you’re not already committed to white. Kristi – are you tallying up the “do white” with the “don’t do white?” HA Whatever you do, have it flow with compatable colors in the adjoining bath. That door will be open a lot, so it should sort of be an easy transition. Your whole house flows easily from room to room, and just follow that pattern and you will be selling a condo in no time flat! School is almost ready to begin, so get that thing ready for a parent looking to find something to buy for their college kid!